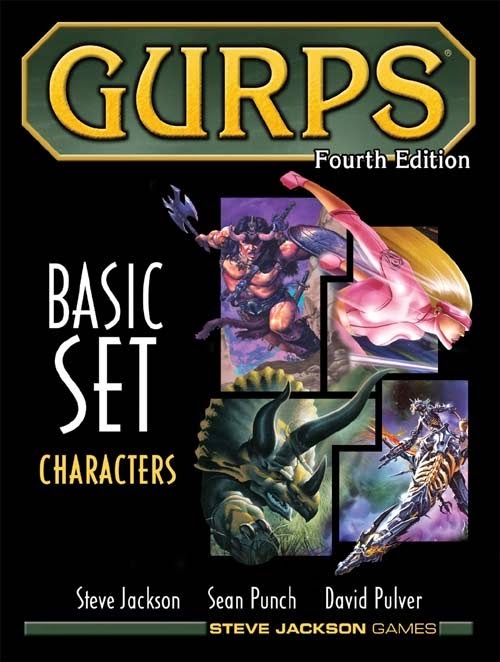 GURPS 4th Edition just celebrated its 10th Anniversary, marking ten long years since Steve Jackson Games essentially killed the brand for me. It wasn't what tweaks they brought to the mechanics - which I actually integrated into my 3rd edition games - it was that they changed their product release paradigm. 3rd and 4th present two ways of doing a "generic, you can-play-anything-with-this" role-playing game. In 3rd, SJGames released over a hundred sourcebooks, mostly settings, SHOWING how you really could play anything with GURPS, and offering modular pieces to make super-powers or martial arts or whatever work with your Basic Set. By contrast, 4th gave us as complete a tool kit as possible, in as few books as possible, and let us go at it. To me eyes, it turned the whole game into Vehicles 2nd, a book that allowed you to create ANY Vehicle, but you had to calculate torque and a million other things. I'm exaggerating, but not by much. So why did I never go beyond GURPS 4th Lite, and yet have a near complete collection of 3rd books? Why yes, I can take 4th's mechanics and work out a campaign, characters, tech, a magic system, for a Vikings campaign, and do all the research myself in history books... OR I can let a game writer do all that research for me and suggest Viking archetypes, rune-based magic, etc. I'm going to go with the latter, thanks. Obviously, I don't think GURPS could have gone to 4th and continued churning out sourcebooks that already existed in 3rd. Or maybe they could have and redundancy be damned. Then again, a lot of GURPS settings were licensed from the last 100 years' greatest sci-fi and fantasy novels - Riverworld, Lensman, Hellboy, Wild Cards, etc. - and there are plenty more cool settings where that came from (GURPS Xanth? Spellsinger? Niven's Known Space?). I'm pretty sure those weren't GURPS' best-selling books, of course. The business model wasn't working anymore. They had to do what they had to do, and it didn't work out. Not for me anyway, but the low number of released over the past decade attests to the fact that perhaps it didn't work out for them either. SJGames is all about Munchkin right now, and good on them. No problem. I've still got all my 3rd Edition books. And maybe you do to, or are picking them up on the cheap somewhere (I always see a lot of them in bargain or used bins at the gaming store). So to pay tribute to the 3rd and still best edition of GURPS, here are five ideas for maximizing your GURPS collection and using as many as possible over the course of a campaign. And no cheating! GURPS has supported some settings with a collection of books - World War II, Traveler, Transhuman - they don't count. Time Travel: Almost cheating, since one could argue that every historical setting is in fact supporting GURPS Time Travel. Well sure, but SJGames itself has never been shy about encouraging synergy between its settings. That's not the same as actually calling books, say, "GURPS Time Travel: Aztecs". But yeah, it's the simplest method. Everything is theoretically accessible through this sourcebook, either through time travel or the also included parallel dimension setting. Warehouse 23: GURPS has a lot of supernatural/conspiracy-flavored sourcebooks. I once set up a Black Ops (not what it sounds like, more Men in Black than The Unit) campaign set at Warehouse 23 (this is before Warehouse 13 was ever on the air, but same thing, except directed by John Woo, if you can imagine it). Whether your power/fantasy level is MiB, Torchwood or X-Files, a team of alien/monster/artifact hunters can make use of a LOT of GURPS material - Places of Mystery, Horror, Monsters, Blood Types, Creatures of the Night, Illuminati, Aliens, Covert Ops, Atomic Horror... even Steampunk. Depends what you want to do. There's enough there to keep a campaign like that alive for years. GURPS TORG(ish): Just a collection of random noises, right? In West End Games' Torg, different realities have intruded on Earth's. It's an invasion from different dimensions, with immediate "terraforming". Torg had its own dedicated worlds, but with GURPS, you can create the Earth Under Siege you'd like. (Or as I once tried to do, let players choose a sourcebook based on the kind of character they want to play, and just use those.) Has Australia been overtaken by Skynet-type robots? Has most of Europe been lost to a new Roman Empire? Who awakened all of China's dragons? Shiftworld: My favorite campaign of anything ever, the idea is to switch settings on the players every so often, forcing them to tweak their characters accordingly after the world... SHIFTS! The twist: Only they remember the previous world; everyone around them is oblivious that they used to live in a Western frontier town just seconds before. Why? That's the mystery. My players never did solve it. Maybe that would've ruined it. Space - Parallel Development: A new idea I just had. Remember how in classic Star Trek there would be these planets that used existing sets and costumes, like the planet of the Nazis, the planet of the Romans, the planet of the 1920s mobsters, etc.? Well, they didn't always use the same reasoning, but at least a couple times talked about the theory of parallel development, that planets not unlike Earth would develop the same way and have similar histories. Personally, I take more stock in the idea that powerful aliens stole people from Earth all through history and seeded them on planets as some huge experiment. So imagine a Space campaign where your starship encounters countless worlds where cultures were evidently transplanted. Some stagnated, others deviated, and a few even evolved faster than Earth central did. Just grab a bunch of books and throw them at the stars! Yes, I've played that game. I have a feeling it spawned more than one Savage Worlds campaign setting. There's not a lot of mechanical difference between GURPS 3rd and GURPS 4th, it was all about presentation. I could easily run GURPS 3rd and say "use this setting book, and ignore/use Compendium I or II" and players could figure it out quickly. GURPS 3rd still had those random generation rules for characters that allowed us to run some quick on the fly games. GURPS 4th did get more structured, and then incorporated everything from Compendium I and II into its pages. It became much harder to sell players on it because it simply had too many options. Even though actual play could be very easy, getting over that initial difficulty curve of char gen was the tough part. I've been looking at going back to GURPS and running some 4E, but I admit I'm kind of in the same boat you are....90% of my GURPS gaming happened in 1st-3rd edition, but 4E created a wall of trouble toward quickstarting GURPS games....which is a real shame, because it's still the same system, just repurposed in a way that puts it in the same troublesome boat at Hero System got itself into. I think you hit the nail on the head there by comparing it to Hero. It's an interesting dilemma about the business case for RPG publishing like that, that bloats/paints itself into a corner on the usability/approachability of a huge tome like that. I wonder if a more solid transition (if one must update editions at all), is to commit to keeping the core book very slim, and keeping the add-on books perpetually available by digital download? 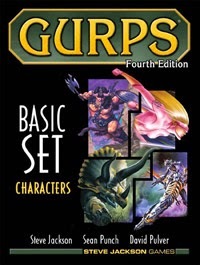 I'm actually a fan of GURPS 4e. I started on 3e, but didn't find the transition painful at all. In fact, since the majority of a 3e book was plain English information, they don't really need revising to be useful with the new edition. The big problem was probably the change to hardcover-only releases. Since each book was a significant investment, they had to focus on their stronger sellers, which were the crunch books, Tech and Powers and whatnot. They've addressed this problem somewhat by releasing smaller new products as PDFs. I say "somewhat" because some of us are still very strongly print oriented. Though some strong selling PDF products have gotten physical print runs, so it's not all bad. @Nicholas: It doesn't have the random character generation system, but that's been replaced by the template system from later in the life of 3e. Reign of the Supermen #554: Superman 1000 C.E. Who Are TNT and Dan the Dyna-Mite?